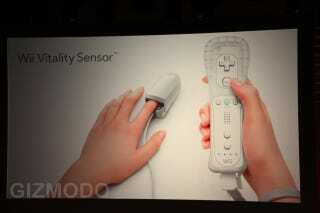 Some news at the Nintendo E3 conference at last: The Wii Vitality Sensor. It tracks your pulse. I'm sure it will have millions of fun applications. Seriously Nintendo, really? What are they going to do with this thing? Probably tie it to Wii Fit and some other games that would monitor your heart rate to make things more difficult. Who knows. Who cares. I think this time this is going too far, and I don't care this makes the console even more popular among different demographics. Maybe I'm too thick today after being bored to dead by that press conference—and I'm the biggest Nintendo whore in the planet. Do you have any extra ideas? Click to viewTo start, here's one suggested by a friend on Twitter: Nintendo Wii, the Nursing Home Console™.